For someone who is playing within a tradition, it is important to keep inspiration high, to keep yourself challenged and contributing on a high level. 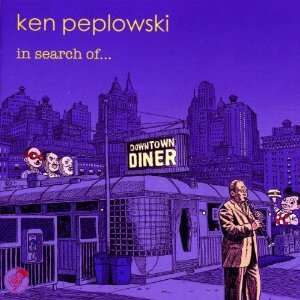 Where perhaps some have fallen victim over time to a kind of creeping fungus of the repertoire, the same tunes played in the same ways time and again, Ken Peplowski has found ways to keep his music very much a thing of today. His newest, In Search of. . . (Capri 74108-2), is a particularly good example. It doesn’t hurt that Bill Griffith’s cartoon illustrations bring a kind of timeless present-in-retro-past feel to the packaging. But of course that is the surface of what the album is about. The first ten tracks find Ken in the company of a nicely wrought quartet that includes the brightly bouyant piano of Shelly Berg, Jeff Hamilton’s swingful drumming and the solid bass of Tom Kennedy. Most importantly the material played is well-balanced and well-chosen. Freddie Redd’s “The Thespian,” Rogers and Hart’s “A Ship Without A Sail,” a couple of nice Berg originals, and on from there. They form excellent springboards for Ken’s sometimes gritty post-Webster, sometimes breathy post-Getzian tenor and his alternately limpid or bell-clear clarinet work. It is captivating fare and Ken sounds fabulous throughout. It’s an album that should find adherents across the spectrum of appreciators of the improvisational arts. It certainly is giving me a good deal of pleasure.